Copyright & Revisions: Original copyright © 1998. Reformatted in 2013. No changes made to text. Publication History: This is the original, unabridged version of the Wrong Side of the Edge. A shortened version appeared in To the Extreme: Alternative Sports Inside and Out edited by Synthia Sydnor and Bob Rinhart. Citation: Watters, R. (2003). The wrong side of the thin edge. In Rinehart, R. & Sydnor, S. (Eds. ), To the extreme: Alternative sports inside and out. (pp. 257-266). Albany, NY: State University of New York Press. I was tired and spent as I rose up over another big wave. Appearing out of white foam like apparition, was the end of a paddle. The paddle, an arm's length away, was that of one of the kayakers who was in front of me. I knew instantly what had happened to him. He was caught, midstream, in a backwash of water known as a hole. I had one fraction of a second . . . and then, our boats crashed together. Somehow, I had managed to pivot sideways to avoid ramming his body with the nose of my boat, but as soon as our boats collided, I was thrown upside down. I rolled quickly back up. Confused momentarily, I wasn't sure where I was or what had happened, but the other boat was gone. Apparently, I had knocked him loose, but I had also succeeded in planting myself squarely in the hole, and I found myself holding on for dear life in the violently surging water. It is moments like these when the metaphor "on the thin edge" seem particularly apt. Teetering on an edge or walking a fine line are visual images which give shape and form to that abstract quality of sports in which the element of risk of bodily harm separates it from other endeavors: a climber delicately perching on the edge of the cliff with the abyss looming below, a circus performer balancing on a high wire without a protective safety net— and, yes, a kayaker caught precariously in a vicious hole in midst of a raging rapid. It is that balancing act on the edge that makes high risk activities so powerful in their appeal. The potential benefits to participants in high risk sports are many and profound. One of the most powerful is the intense personal feelings or arousal and excitement, the "adrenaline rush," if you will. Isn't all this talk about the possibility of dying— about the wrong side of the fine edge— a little bit fatalistic? Certainly, unnerving thoughts of my own mortality flashed through my mind while I was being flung about in that violent mid-river hole. I stayed up for a moment, then the powerful currents of the hole, slapped me upside again. Under the water, I was tossed from side to side like rag doll clamped between the jaws of dog. It was everything I could do to hang onto my paddle. Though weak, I managed to roll up and caught a quick glance down river. It didn't look good. I was midway down a long rapids. The river below me strained through a maze of large boulders and slammed up against a cliff. Already tired from the long stretch of rapids above the hole, my energy was ebbing quickly. I knew that by now my companions were far down the river. If I swam, I'd be on my own. It would be a terrible and frightening swim through those unplacable boulders. Instinct told me that my chances of surviving the swim in my weakened state were close to nil. The German philosopher Fredrich Nietzsche once wrote: "When you look long into an abyss, the abyss also looks into you." Indeed, I found my eyes locked on the cold, icy stare of the abyss. I don't recall how many times my boat had been knocked over end for end, but during one of the endos, the bow dove deeply catching a downstream current. Suddenly I was out of the hole, the boat listing heavily to one side and spinning out of control toward the boulders below. With my remaining strength, I made feeble strokes towards shore. Two last pulls on my paddle jammed the boat onto a pebbly beach a few feet above the boulder death trap. I was safe. Although shaken, I got back in my kayak and finishing running the rapid without any further mishaps. Now over 20 years later, I still enjoy kayaking, and I still feel just as firmly as ever that high risk sports are essential, that we must do everything that we can to protect the right of people to participate in such activities. But I also look back at this experience as the beginning of a perceptible change in me. Once you've seen those red eyes glowing from deep in the dark void, you're never really quite the same. The world has become far too safe, and heretofore unknown lands, mapped in far too much detail. As a consequence, we need as many outlets as possible for people to participate in challenging outdoor activities. We need wilderness lands; we need rock climbing areas; we need wild rivers; we need outdoor schools; and given proper environmental safe guards, we need free and unfettered access to outdoor areas. The right to risk is unalienable. It makes our society healthier and more vibrant. Yet, at the same time, we need to relook at what has happened to high risk activities over the last quarter of the 20th century. In our efforts to provide programs, create new markets and promote high risk sports, we have gradually come to a point where we have over-glamorized them and created an image for general consumption that is far different than what these activities really are. We have diverted people's attention from the not-so-glamorous possibility that one can get killed, concentrating attentions only on the fun and safe side of the dangerous edge. It is a mendacious, one-side view that has pervaded nearly every corner of our society: magazines, television programs, commercials, movies, outdoor education programs, and guided and outfitted trips. The effect has been to make the high risk experience into something akin to a visit to Disneyland or the carnival. There's a big difference. At Disneyland everything is safe. Not so in the outdoors. We were far better off when climbers, kayakers, backcountry skiers and the like were considered a part of the lunatic fringe. To illustrate the dramatic changes that have occurred it is helpful to look at whitewater rafting. Twenty-five years ago, it was considered fairly adventurous to take a trip down the Middle Fork of the Salmon, a river consisting mostly of Class III rapids. Now glossy, colorful brochures invite the public to take trips down wild, Class V rivers — no experience necessary. Indeed with proper equipment and well-trained guides, Class V whitewater is possible and is run all the time. But what if something goes wrong. What if one of the clients is thrown out of the boat above a rapids. Then what? If a rafting passenger falls into Class III water, they can usually be pulled back in the boat without much trouble, but all bets are off when it's Class V water. Charlie Walbridge who for years has been collecting data on river accidents has observed a troubling trend. He reports more fatal accidents occurring because boaters are unprepared— or simply overwhelmed— by the severity of the water they are running. "For years the physical ability, experience, and fitness of rafting guests have been declining," says Walbridge, "Better equipment and improved guiding skills make it possible to run more difficult rivers, but the guest who ends up in the water may overwhelmed and helpless." (Walbridge 1995) The margin of safety on Class V water is extremely thin. Competent and safe kayakers and rafters who run such water do so only after slowly developing their skills and working up to it. Yet, more and more commercial guided operations are offering Class V trips to people who essentially walk in off the street. What is alarming is that such trips can create unreal expectations on the part of the paying passenger. They go on the trip. They have an exciting time, and some of them leave with the feeling that now they can run such water on their own. The same thing can happen to those who watch movies and videos of high risk sports. Caught up in the thrill of it and seduced by the nonchalant attitude of many of these films, they say, "Hey, I can do that too." This false sense of security according to psychologist, Michael Apter in his book The Dangerous Edge (Apter 1992) comes from an unrealistic assessment of their ability. Using the metaphor of a cliff's edge, Apter theorizes that every activity in life has three zones: a safe zone where one is far away from the cliff's edge, the danger zone where one walks on the edge, and the trauma zone where one has fallen off the edge and has been hurt or killed. Apter believes that when people seek excitement, they put themselves in he what he calls a protective frame which is built through skill, proper equipment and preparation. The protective frame allows them to come close to the edge, but not to fall into the trauma zone. What can happened according to Apter is that people can be tricked into thinking they are operating within a protective frame when in reality they are not. Reinforced by what they hear and see on the media and combined with lack of knowledge and skill, the boundaries of the protective frame are completely obscured. Apter says: "One seems simply to be playing an exciting game with no repercussions." That is exactly what the over-glamorization of high risk sports can do. It blurs the distinction of what is real and unreal. It happens to the paying passenger on a guided trip— or the impressionable viewer of an "action video"— who then goes out and jumps in a Class V river on his own and drowns. There is no protective frame for those lured by Madison Avenue ad campaigns. High risk sports are dangerous games of brinkmanship— not with another human foe, but with a passive forces of nature. 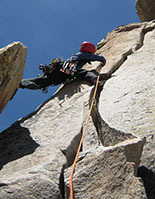 Thus, it is incumbent upon participants that, even though they may sometimes balance precariously, they must at all costs stay on the living side of the edge. One misstep and its game over. Sometime after my close-call on a river, I began thinking more about the limits of high risk sports. How far do we dare take them? At what point, do we cross the line in our eagerness to interest others and lead people on an uncertain path? Those questions haunted me for a number of years as I worked on the biography of kayaking's most famous personality, Doctor Walter Blackadar (Watters 1994). If there was any life in which the hard questions of high risk sports were asked, it was in Blackadar's. His story and experiences are worth a closer look. Blackadar is one of those giants who come along every so often, who envision great possibilities, make a great leap and forever changed the nature of the sport. For anyone who loves the outdoors, his life story reads almost like a fairy tale. He was a well-like and respected physician in a small town in Idaho. Originally from the east, he moved west in 1949 so he could be near fishing, hunting and river running. 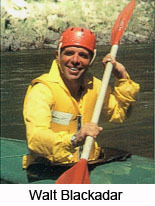 He took up kayaking in the 1960s long before it became fashionable to drive around with a kayak strapped to the top of a car. In fact, at the time the number of kayaks in the state of Idaho— one of the west's most profligate states for whitewater rivers— could be counted on one hand. His early kayaking days were carefree and hedonistic. He was famous for serving up a potent mixture of vodka and lemonade from his water bottle. He had quickly adopted the west— and its mythology— as his own, and around the campfire at night, he regaled trip companions with wild stories and demonstrate his prowess with a .44 magnum pistol. On a hot afternoon, he would shed his clothes, salvo pudore, and frolic on the beach with his young kayaking friends. The difficulty of the rivers he ran increased each year. He approached rivers cautiously, but there was always a light, carefree attitude to his trips— until a fateful day on the West Fork of the Bruneau River. The Bruneau River lies in the remote, basaltic desert of southwest Idaho. It is an undulating land, draped in a greyish-green shroud of sage. Slicing through the desert like a bolt and branches of lightening is the Bruneau River with its several tributaries and forks. In April of 1974, Blackadar put together a party of five kayakers to run the West Fork of the Bruneau. Blackadar who had run the river before did not consider the West Fork to be a particularly difficult river as long as the two or three unrunnable rapids where located and portaged. As they worked their way down the river, they employed a cautious approach: Blackadar was first. Julie Wilson, a young admirer of Blackadar visiting from the southeast, was in the second position behind Blackadar. Wilson replicated his moves, stopping when he did and not passing him. The other three kayakers on the trip fell in behind Wilson. Unless the water was obviously easy, no one was to go beyond Blackadar. Midway through the second day of the trip, they approach a falls which consisted of four drops through a maze of boulders. The falls was one of the unrunnable rapids that had to be portaged. But when river runners first approach a rapids, it is sometimes difficult to ascertain it's difficulty until moving up closer to the edge. Blackadar found himself in that position. He couldn't see the coming falls. A juniper tree had fallen and blocked three fourths of the river, hindering his view of what lay downstream. To get to a better position, he paddled around the tree and slipped into an eddy, the last remaining stopping point just above the falls. Looking below him, he now knew that the falls was unrunnable and would have to be carried. According to kayaking protocol, the other kayakers should have stopped in eddies above Blackadar and waited for a signal, but the Juniper tree complicated the situation. Julie Wilson paddled around the tree, but the eddy that Blackadar occupied was too small for her to get into. She drifted towards the edge of the falls. Blackadar, now realizing her danger, yelled. It was too late. Reacting quickly, Blackadar sprinted out in front of Wilson. He knew she was heading into a dangerous falls, and he wanted to be in front of her to guide her along the best path he could pick. They both plunged into the falls. On the first drop, Blackadar capsized and tried desperately to roll. When Blackadar came up, he had lost track of Wilson. He plunged down through the next drop, and the next, and somehow ran the rest the treacherous falls. Not finding her at the bottom, he hoped that she might have been washed downstream. Leaving the others who had managed to get out at different points mid way down the falls, Blackadar paddled off trying to find her. He never found her. After searching for several hours, an agonized Blackadar realized that Julie Wilson had drowned, her body caught somewhere under the water in the falls. It wasn't until three weeks later while Blackadar was attending Julie's memorial service in Atlanta that her body was found by friend near the falls. She was buried overlooking the river and the rapid which now bears her name. I interviewed many of Blackadar's friends and acquaintances when I was working on his biography Never Turn Back. It was obvious that Julie Wilson's death devastated him. He had danced with danger on rivers, playing the odds but he always managed to come out the winner. He delighted in balancing on the fine edge separating life from death, staying an arm's length away. He had thought carefully about his own death and writing about it, he had said that it would willingly but grudging be accepted. But in the end when death came on the river, it was not his own. It was somebody young and hopeful just starting her life. There are a number of parallels between Walt Blackadar and a contemporary of his in the mountaineering world, Willi Unsoeld. Willi Unsoeld had named his daughter, Devi, after what he felt was one of the most beautiful mountains in the world, the 25,645-foot Indian peak, Nanda Devi. In 1976, Devi who had been well-schooled in art of mountaineering by her father, attempted to climb her namesake. 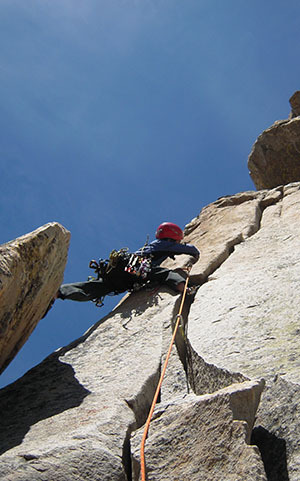 On the climb she was strickened with a blood clot and died. It was impossible to remove her and like Julie Wilson's grave in the Bruneau desert, the remote Himalayan mountain became her resting place. Unsoeld could never look at death quite the same way. "How does one handle the death of a surpassing human being?" He asked, and then answered. "You don't. It handles you. It rubs your nose in the reality of your mortality." (Leamer 1982, 328) Both Unsoeld and Blackadar learned the despair of losing someone and dark emptiness of the other side of the edge. Walt Blackadar never recovered. He returned to kayaking and continued to push back the barriers of the sport. His last great problem was Devils Canyon of the Susitna River which drains the southern half of the Alaska Range, the roof of North America. Although, he ran all of Devils Canyon's rapids, he never quite ran them cleanly without a swim, the way he wanted. His third attempt at the Susitna when he almost lost his life during a horrifying swim through some of the canyon's largest rapids seemed nihilistic. Yet, he was conservative and protective when it came to other members in his party. Once while ABC was filming him and several other outstanding kayakers on the Colorado for a nationally televised program, Blackadar asked one of the kayakers, Lynn Ashton, to wear a larger life jacket. He had long felt that more buoyant life jackets increased one's chances of survival in big water rapids like those found on the Colorado. She agreed. Blackadar turned away with tears in his eyes. It was moving, poignant moment and there was little doubt that his tears were for Julie Wilson. What happened to Julie Wilson and Devi Unsoeld can happen to any one involved in high risk activities. We must never forget them. Their stories remind us that our companions, friends and love ones on high risk forays can also slip and tumble over the wrong side of the edge as easily as we can. Indeed, if Blackadar's haunted life after Julie Wilson's accident is any indication, there also is a wrong side the edge for the survivors as well. No matter how thoughtful and sound our reasonings, death on a river or on a mountain can not be easily explained away. Listen to what John Krakauer has to say in Into the Wild, a book about a young man by name of Chris Johnson who in April of 1992 traveled Alaska and had attempted to live off the land (Krakauer 1996). Tragically, Johnson's attempt to survive in the Alaskan wilderness failed, and he essentially starved to death. Krakauer describes a scene in his book where he meets with the parents of Johnson for an interview. Johnson's mother sits at the dining room table looking through pictures of her son and breaks into tears: "weeping as only a mother who has outlived a child can weep," Krakauer writes, "betraying a loss so huge and irreparable that the mind balks at taking its measure. Such bereavement, witnessed at close range, makes even the most eloquent apologia for high-risk activities ring fatuous and hollow." Walt Blackadar broke into tears often in the years following Julie Wilson's death, and though haunted by her death and plagued by injuries, he doggedly continue to kayak. 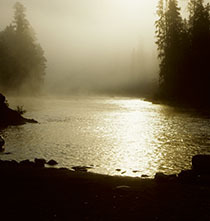 In the 1978 in an attempt to ready himself for another film project with ABC American Sportsman, he joined with several friends to run the South Fork of the Payette, a river not far from his home in Salmon. Part way down the river, two lead kayakers spotted a log just barely showing above the surface of the water and extending nearly all the way across the river. They quickly caught an eddy on the far right. Blackadar was immediately behind them. To the two kayakers pulled off to the side, it look as though Blackadar did not see the log. It might have been hidden under a surge of water when he looked downstream. To their horror, Blackadar nonchalantly drifted toward the log. They had no time to warn him. He was suddenly jarred when his kayak hit the submerged tree. The bow immediately dove under, and the onrushing water slammed his body against the log. Blackadar reached over the log laying on his paddle in a technique known to kayakers as a high brace. The high brace might have helped him get around one side of the log, but the log slanted toward deeper water. As the current bounced the boat, he was pulled deeper and deeper into the water. He held bravely onto the high brace, even as his head slowly disappeared under the water. The back end of the boat rose up, stood vertically and collapsed against his body. The boat and Blackadar were completely trapped and immersed under water. There was nothing the shocked kayakers could do — no way of reaching him, no possible way of getting a throw rope to him. To have someone swim out and try to get a rope to him would have been impossible — and foolish since it could have risked entrapping two people. And so, Walt Blackadar died on the river. His body was recovered the next day and he was buried in the Pioneer Cemetery overlooking the South Fork of the Payette River. Julie Wilson, Devi Unsoeld, Walt Blackadar. What is there to learn from them? Certainly none of them would have would have discouraged us from taking up kayaking and climbing and other adventurous activities. They all talked of how important such sports were to them. On the other hand, I'm sure that all three of them would have also agreed that risk in outdoor activities must be carefully evaluated. How is that done? Very simply, one must start slowly, learn the skills of the sport, and put in an apprenticeship. With such a foundation, one then has the knowledge to make informed decisions about how much risk is personally acceptable to them and the steps can be taken minimize risk. We all have our own thresholds of acceptable risk, and we must never let bravado or marketing hype or pressure from others influence that. Accidents, such as I have described here, are warning shots across the bow. They are reminders that we have moved ever closer to the fine edge. Once all the fanfare is stripped away, these activities are real, real enough to kill people. Outdoor educators, guides, writers, outdoor companies, film makers must do everything possible to make potential participants as fully aware of the risks as they do of the fun and excitement of sport. Not to do so does irreparable harm to high risk activities and ultimately to those eager to try them. Apter, M. J. (1992) The dangerous edge: the psychology of excitement. New York: The Free Press. Krakauer, Jon. 1996. Into the wild. New York: Anchor Books. Leamer, Laurence. 1982. Ascent: the spiritual and physical quest of Willi Unsoeld. New York: Simon and Schuster. Walbridge, Charles. 1995. 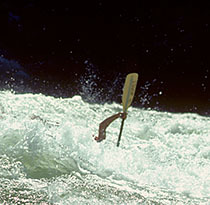 "River accident overview 1995," American Whitewater, September/October, 29-37.